The American Journal of Criminal Law is proud to announce the immediate availability of Volumes Volume 44:1-2 (2016-2017) and Volume 45:1 (2017-2018), as well as the opportunity to order Volume 46:1-2 (2018-2019). We invite you to subscribe thereby ensuring your receipt of this fine legal periodical. Hardcopy subscriptions ordered through our publications office are available domestically for only $30 per volume/academic year and $35 for foreign delivery. Recent single issues are only $15, including USPS shipping for domestic orders. 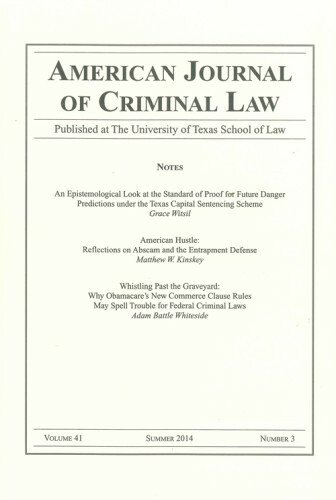 We believe the American Journal of Criminal Law will be a great resource to you and your library and look forward to including you in our family of subscribers.